Recently GM has switched to a much more robust security seed/key system. 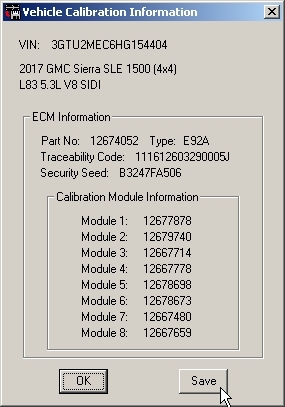 Each ECM/TCM has a unique seed/key pair. The WinFlash OBDII program can not calculate these more complex security keys so you will need to request these security keys from C.A.T.S. To work with these new ECM/TCMs you'll need to install the latest updates to the OBDII Tuner and WinFlash OBDII programs. You can download the update to the OBDII Tuner program here and for the WinFlash OBDII program here. When purchasing a special security key you'll need to provide us with the security seed for the ECM/TCM. 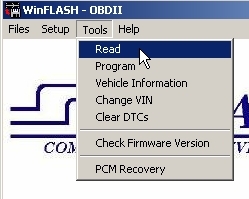 There are a couple of ways to do this with the latest version of the WinFlash OBDII program. 1. 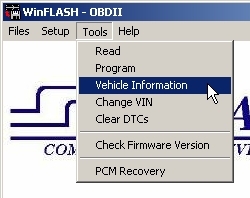 Connect you OBDII interface cable to the vehicle, turn the ignition on and start the WinFlash OBDII program. 2. Click on the 'Tools' menu and select 'Vehicle Information' from the drop-down list. 3. This will display the Vehicle Information screen which now includes the security seed for both the ECM and TCM. If you click on the 'Save' button you can enter in a file name and a file with this information will be created in the selected folder. 4. E-mail this file to us at tc@tunercat.com when you order the security key and that will give us all the information we need. 2. Click on the 'Tools' menu and select 'Read' from the drop-down list. If you are working with one of these new ECM/TCMs you'll see the following display. 3. When ordering the security key for this ECM/TCM place all the information in the 'Security Seed' box in the order notes or alternatively send this information to us at tc@tunercat.com in a separate e-mail. 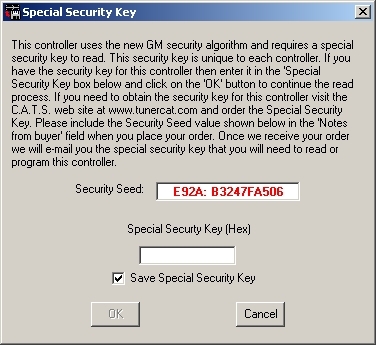 Once you receive the security key for the ECM type the key into the 'Special Security Key' box and click on the 'OK' button to proceed with reading (or programming) the ECM/TCM. If the 'Save Special Security Key' check box is checked then the WinFlash OBDII program will save the security key for this ECM/TCM and you won't need to re-enter it to read or program this ECM/TCM again.